Apple Inc.’s (AAPL.O) pulled thousands of gambling apps from its Chinese store after the nation’s state-run broadcaster accused the smartphone maker of dragging its feet on cleaning up banned content. Government-controlled media including China Central Television attacked Apple this month for hosting illegal and fake lottery-ticket apps, which they said resulted in massive losses for hoodwinked users. On Sunday, CCTV reported that Apple pulled at least 4,000 apps tagged with the keyword “gambling” on Aug. 9 alone. The U.S. company confirmed the action and said it was simply complying with regulations. But it underscores both Beijing’s resurgent crackdown on all forms of online content from games to social media and video services, as well as the difficulties facing foreign companies that do business in the world’s second largest economy. The U.S. company has much at stake in China, its largest market after the U.S. as well as the main production base for the world’s iPhones and iPads. Its market position however has come under attack from a coterie of savvy domestic players from Huawei Technologies Co. to Xiaomi Corp., which offer users there more locally oriented services. The heightened scrutiny from government regulators coincides with an escalating trade war with the U.S., which has levied punitive tariffs on Chinese goods in what’s regarded as an attempt to counter the Asian country’s ascendancy. The fear is that growing tensions may eventually spur Chinese consumers to boycott American goods, though that hasn’t emerged on a large scale. 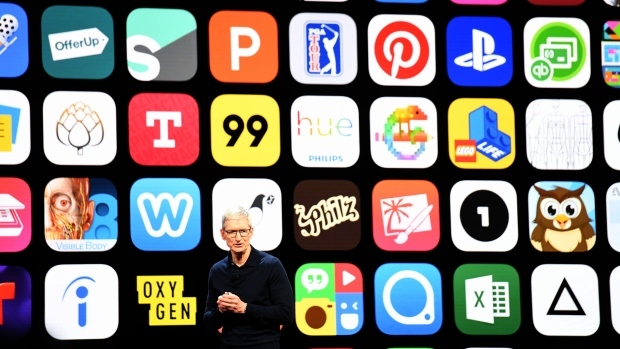 While thousands of apps is a drop in the ocean for Apple, its response demonstrates the tricky position foreign firms find themselves in when operating in a country that can be unpredictable in the way it polices content. The CCTV report also serves as a timely reminder for companies such as Alphabet Inc.’s Google (GOOGL.O) trying to stake out a spot in the world’s largest market for internet services, but often find themselves navigating alien territory. Apple itself has run afoul of Chinese regulators in the past. In 2013, it was forced to apologize and tweak its customer policy after CCTV accused the company of poor service standards. Last year, it was forced to take down hundreds of virtual private network apps in response to criticism about tools to bypass internet censors.